In Phoenix, Arizona in 2010, a group of people's lives intersect in interesting ways. The elderly Daisy gets into a car accident and is in rehab just as the nephew she never met and his wife Enid move to Phoenix. A chance meeting between them leads to the wife seizing control of Daisy's assets and selling her home to Charlie and Dave, a couple that moved from San Francisco to Phoenix for the job Dave soon comes to loathe. Across town, the psychic Anna has undocumented resident Ernie doing work on her home. He saves her from an attempted robbery from a gay homeless teen, but is then deported to Mexico. From there, some relationships are built and others deteriorate. 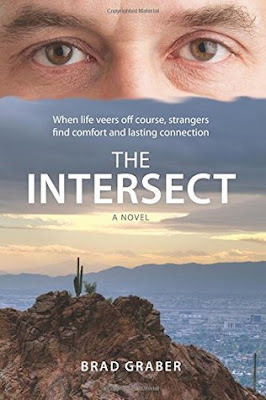 I was very surprised to find out that The Intersect was Brad Graber's first novel. There's an easy flow to the story, which weaves the life stories of all the characters together. There are flashbacks to their pasts, which allow the reader to learn the circumstances that shaped each character. It gives us a better understanding for their motives; no one is demonized or turned into a faultless angel in this book. Even if you don't grow to like certain characters (particularly Enid), you understand why they do the things that they do. I was very interested in learning more about everyone in the book, and how the two "halves" of the cast of characters would meet and affect each other. The ending seemed abrupt, because there's no sense of completion. We begin with Dave and Charlie's plane ride to Phoenix, and we end with their conversation. There's a slice in their lives, but I feel as though there could be so much more left to learn about everyone in the book. I can't even think of another complaint about the story right now, because I felt so emotionally invested in what had happened, feeling their losses as if they had belonged to a friend's. I was sad to finish the book, because I easily could have read another couple of hundred pages about them.